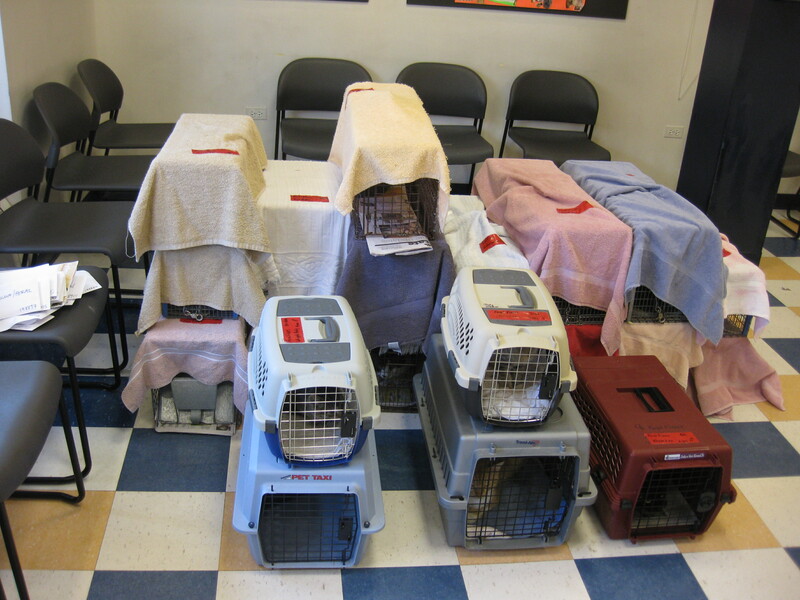 Last Wednesday, we took in 21 more cats to the PAWS-Chicago Spay/Neuter clinic to be spayed/neutered. These cats came from Aurora, Bensenville, Addison, Wood Dale, Elmhurst, Bloomingdale, Wheaton, Glendale Heights and Westmont. 16 of them were ferals while the other 5 were 'friendly ferals'. Super-volunteer Sue loaned us the use of her van (again) so that we could take these cats all in one load (thanks Sue!) and new volunteer Danielle rode with me in the morning on the way in to both help me and to 'learn the ropes' so that she can start to transport herself (thanks Danielle and welcome aboard!). Once again, it was super-volunteer Judy stepping up to do all of the coordination work for these 21 cats - stepping in for Tammy while she continues to recover from shoulder surgery - thanks Judy! The picture thumbnail is of the 21 cats at PAWS before I started loading them into the van. If you click on the picture, you'll see a larger version of it. With these 21 cats, Feral Fixers has now processed 36 cats for the month of July, 428 for this year and 1,907 overall. Yes, we're closing in on our 2,000th cat!